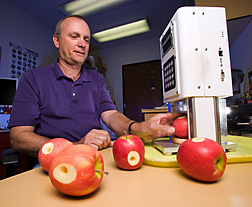 Technician David Buchanan uses a recording penetrometer to measure apple firmness, a key component of apple fruit quality. Pick an apple off the tree and it’ll last a few weeks before it starts to turn soft and rot. Store an entire harvest under controlled-atmosphere conditions and it’ll last up to 10 months, depending on variety. But the clock starts ticking again once the apples are removed from storage. To slow the proverbial sands of time, some fruit distributors treat their apple bins with a gaseous compound, 1-methylcyclopropene (1-MCP). It extends the fruits’ poststorage quality by blocking ethylene, a colorless gas that naturally regulates ripening and aging. Mattheis’s experience with 1-MCP dates to the mid-1990s, when he and colleagues were first to show that the gas prevents superficial apple scald, a discoloring peel disorder that is considered a major storage problem. Treating apples with the chemical antioxidant diphenylamine can prevent scald, but the practice can be complicated and requires careful monitoring. Maine’s 2004 apple crop, for example, saw a 43-percent decrease in fungicide use, thanks to 1-MCP. 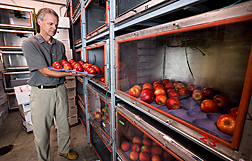 And on Red Delicious and Granny Smith apples placed in controlled-atmosphere storage, the gas treatment has eliminated the need for diphenylamine to prevent scald. In Maine and other apple-growing states, including Washington and Michigan, and in 20 foreign countries, use of 1-MCP is an evolving success story that traces its beginnings to discovery and later patenting of the compound (in 1996) by North Carolina State University (NCSU) researchers Edward Sisler and Sylvia Blankenship. 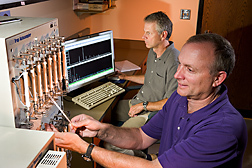 Using gas chromatography and mass spectrometry, plant physiologist Jim Mattheis (left) and technician David Buchanan analyze volatile apple compounds that contribute to both aroma and flavor. The NCSU team’s 1-MCP studies prompted other research groups, including Mattheis’s lab, to investigate the gas and its physiological effects on plants. Besides their horticultural interests, the two labs shared another connection—Agrofresh, a Philadelphia-based company that licensed the NCSU team’s patent on 1-MCP and commercialized it as SmartFresh. This product releases the gas from an encapsulated form when exposed to water. Under a trust-fund agreement with AgrFresh, Mattheis worked with the firm to evaluate the gas’s use, first on pears and then on apples. He and collaborator Xuetong Fan of ARS’s Eastern Regional Research Center in Wyndmoor, Pennsylvania, also found that 1-MCP decreased degreening of broccoli, browning of lettuce, and bitterness in carrots. Apple varieties tested include both U.S.- and foreign-grown varieties, such as Gala, Red Delicious, Golden Delicious, Braeburn, Granny Smith, Fuji, and Pink Lady apples. Mattheis and collaborators identified the best application methods and dosages for each variety and documented the fruits’ physiological responses to the regimens. Of particular interest was the gas’s effect on apple firmness, acidity levels, color, taste, and aroma—all of which affect fruit quality and marketability. Besides establishing the efficacy of 1-MCP for most apples grown in the Pacific Northwest—more than half the total U.S. crop—Mattheis’s research team also helped AgroFresh garner federal approvals needed to commercialize the gas. Their work also helped in establishing variety-specific guidelines for using it effectively. In March, ARS honored Mattheis for his technology-transfer achievements and collaboration with AgroFresh and the apple industry. But he’s quick to credit his collaborators—among them NCSU’s Sylvia Blankenship; Luiz Argenta of Estacao Experimental de Cacador, Brazil; Elizabeth Baldwin, at the ARS’s Citrus and Subtropical Products Research Laboratory in Winter Haven, Florida; and Jinhe Bai and Paul Chen, both at Oregon State University, Corvallis. “Use of 1-MCP has had a huge impact on the apple industry worldwide. I’ve been fortunate to have been involved and to have had great people to work with on these projects—in my lab, with scientific colleagues at other locations, and with AgroFresh personnel,” says Mattheis.—By Jan Suszkiw, Agricultural Research Service Information Staff. James P. Mattheis is with the USDA-ARS Tree Fruit Research Laboratory, 1104 N. Western Ave., Wenatchee, WA 98801-1230; phone (509) 664-2280, fax (509) 664-2287. "Keeping Apples Crunchy and Flavorful After Storage" was published in the October 2007 issue of Agricultural Research magazine.